The company that let us play The Secret of Monkey Island in our browser and just started letting people play a sort of Guitar Hero on Facebook is shutting down. The company also owns the Torque engine which is used in many independent web and disc-based games. The engine is now up for sale. Today, InstantAction informed employees that it will be winding down operations. While we are shutting down the InstantAction.com website and Instant Jam game, Torquepowered.com will continue to operate while InstantAction explores opportunities with potential buyers for Torque. We thank all of our past and current customers for their support. 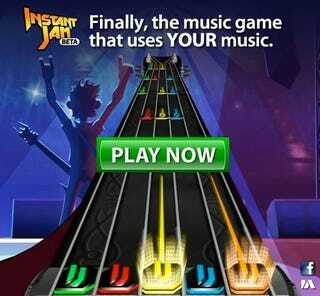 Instant Action had just released the Guitar-Hero-style Instant Jam this past summer and made it embeddable in browsers late last month. That game let people play a simplified version of popular music games in a web browser while seating in front of their computer keyboards or with a guitar plugged into their PC. The company was formed a couple of years ago after media mogul Barry Diller invested in Oregon-based Garage Games, the indie-friendly studio behind the Torque engine, to build a platform for high-end video games playable in web browsers. Kotaku has reached out to Instant Action for further comment. UPDATE: A spokesperson for Instant Action parent company IAC, said Instant Action was shut down because "it was operating in a highly competitive industry, and the business didn't scale profitably in the manner we had expected." Earlier this week Diller's IAC announced plans to lay off 130 people from its Ask.com division. It also is rumored to be announcing a merger tomorrow of its Daily Beast online publication and Newsweek.